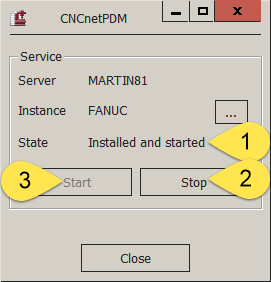 Clicking on button ‘Manage’ in section ‘Service’ also opens a dialog window that enables you to select a PC and/or an instance of CNCnetPDM, see chapter ‘CONNECT TO SERVICE’ for details. If the connection succeeds a dialog opens that allows you to see the current state (1) of the selected background service. Clicking on button ‘Stop’ stops the selected service. By clicking on button ‘Start’ you can start the service again. Button ‘Manage’ only connects to CNCnetPDM running as a background service.